Church History: Fifth Presbyterian Church was founded in September 1899. On January 30, 1905 the church moved from the third floor of City Hall Annex to a new stone building on W. 3rd near Norris St. The following brief History of Fifth Presbyterian Church is taken from the Home Directory of the Colored People of Chester, 1906 compiled by Lawrence L. Barrett & C. I. Wilson. This reference is available at the DCHS research library. 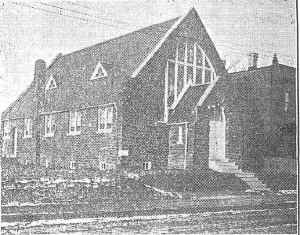 The first meeting looking toward establishing a Presbyterian Church among the colored people of the city of Chester, was held August 14th, 1898, at a private residence 1104 West Eighth street. The meetings continued until November 27th, of the same year. A room having been secured in the City Hall on Market street, the regular church services were conducted there. Accordingly, on May 18th, 1898, the church was duly organized under the title of the Fifth Presbyterian Chrch of Chester, Pa., with the following seven persons as members, all of whom, except tow are now living and are still active in its membership: Dr. D. W. Postles, Mrs. Lillian C. Postles, Mr. James Freeman, Mrs. A. E. Freeman, Mr. Richard Nugent, Mrs. Annie Collins, Mrs. Thomas H. Hudson. From this time, strenuous efforts were made to secure ground and erect a church building, for the now growing congregation, which labors were abundantly rewarded by obtaining a lot on West Third street below Norris, and the erection of a handsome stone structure, the present edifice, with all modern church arrangements and conveniences, with a comfortable seating capacity in the main auditorium for several hundred persons, at a cost of ($8,000) eight thousand dollars. The windows are a rich mulled and stained glass, with two memorials, one by Mrs. Catharine Nugent to her son, the late Richard Nugent and elder of the church, and a graduate of Lincoln University, who departed this life February 19th, 1904, and another dedicated to the late Rev. D. A. McWilliams, a devoted friend of the church, and formerly pastor of the Second Presbyterian Church of this city, erected by the sessons [sessions] of the Presbyterian Churches of Chester. The new building was dedicated and occupied January 27th, 1905. The pastor and congregation of the Fifth Presbyterian Church are deeply sensible of the earnest moral and financial assistance extended to them by the other Presbyterian bodies in the city, to which extent, that no mortgage or indebtedness remains on the property. Elders - D. W. Postles, M.D., T. N. Collins, C. E. Nutter, J. E. Fowlkes. Trustees - Thos Hudson, D. W. Postles, M.D., Tilghman N. Collins, James Freeman, Oscar Erving. © 2000, 2001, 2002, 2003 John A. Bullock III.